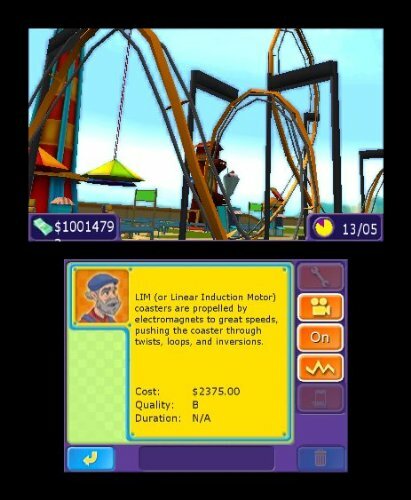 Roller Coaster Tycoon 3D is a new installment of the well known franchise and will only be available on the Nintendo 3DS. The game has been released by Atari and this will be an attempt to bring the sim game that we love to a new, smaller, size. Normally a game like this would not need a story but the developers decided to add a ‘storyline’. The story mode of the game starts out with you having to choose your character. (boy or girl – simple as that) After this not so nerve-wracking choice you will be presented several stages to choose from. The first few of these are basically tutorial levels and a few ‘normal’ levels you will need to finish to start unlocking the other levels. After the first set of levels you will enter ‘theme based’ levels which are simply revolving around different themes you can use in the creation of your amusement park. The real story aspect however are the short drawn and text-based scenes we get to see at the beginning and the end of the level. During these scenes you will simply see your character getting verbally abused by the clients that need his help and it will turn in to fairly cheesy and amusing little sketches. The attribution of a storyline in this type of game has been a pleasant one but even more detail concerning the scenes would have been an even greater attribute. As stated before the story is a pleasant one but quite a short one. The graphics can be described pretty bluntly: The game looks nice but we’ve already seen way better on the 3DS. Don’t get me wrong the Coasters you build look very attractive, the other rides look colorful and very much alive and your visitors (also called the peeps!) look as if all the characters from minecraft are enjoying their day off in your amusement park. Still all of these things combined feel like we took a step back and it makes you feel like the game was actually designed as a transition between the DS and the 3DS and not really the 3DS we’ve seen in several titles. The good part however is that graphics aren’t really that important in a game like this and you will still enjoy the scenery as much as you would with better graphical quality. Note: The menu’s look quite horrible. The overall sound is enjoying and adds to the atmosphere of the game. The developers seem to have decided to keep the background music a little more unnoticeable so that you would not get annoyed after playing the same map for a reasonable amount of time. Roller Coaster Tycoon has a subtle soundtrack that really suits the game, seeing you will be busy building your park anyway. For those who are new to the Roller Coaster Tycoon games, they revolve around you bulding your own amusement/theme park by placing different rides, shops, roller coasters and so on. The game offers us quite a decent amount of rides, shops, rollercoasters etc. Each category can count on about 25+ (or even 40+) different options on what we would like to build. We are even able to hire our own staff to keep our newly created park running or cleaned up. The extra bonus in this 3DS version is that you will be able to experience all the rides by ‘climbing’ in them and turning on (or off) the 3D mode of your 3DS which tends to give a decent reality feeling of actually being in the rides. Being able to use this function will also motivate you on building a lot of different rides or constructing a lot of different roller coasters just to try them out. A great way to fully explore the game and even add some time to the overall length of the game. Your gameplay will mainly consist out of you using the touch screen to select and drop rides, shops, roller coaster, … to the places you like and connect them to your main paths with the paths that you decide to build. Building paths and constructing the rails for your roller coaster are done in nearly the same fashion, namely you clicking on the direction on which you want to build piece by piece. This mode of constructing will take a little time getting used to but after a short while this will feel quite natural and surprisingly good for this type of game on a handheld. Roller Coaster Tycoon 3D also presents you with a way of drawing your paths with the stylus but this mode feels horrible and it will end up taking you way more time than it’s supposed to because you will constantly need to erase the mistakes you have made. Roller Coaster Tycoon 3D consists out of 3 main playing modes, namely: Coaster story, Coaster creator and the Park sandbox. Coaster story is a great mode if you’re new to and want to learn how the game actually works. As stated before this mode pretty much includes a tutorial mode and missions in which you get to learn the different types of themes you can implement in your own park. Overall most of the ‘missions’ have several objectives you need to complete before being able to complete the level. (bit if you want to you can keep playing after the objective have been fullfilled) This mode is a very fun mode to play and adds a little structure to the games for all of you that don’t know where to start yet when desigining your own epic amusement park. Coaster creator is the mode for those who want to try and build different types of roller coasters on a map with enough space and pretty much an endless supply of money to do so. In this mode you will be able to try out every single type of rollercoasters to design one to your liking. (only 1 rollercoaster can be created here – if you want to create an other one you will need to clear the map first) The fun part in this mode is that you will be able to save your creation and load it (when you have enough money) on a different map later. Overall this is pretty much a trial and error mode for creating different types of roller coasters. The park sandbox is where you will end up when completing the story and having built a decent supply of different roller coasters. 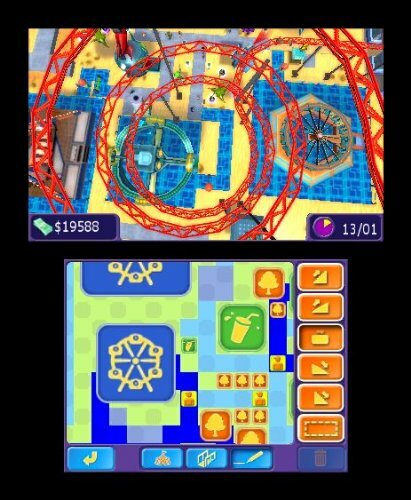 In this mode you can start up you own amusement park on the map type you desire according to the theme type you have in mind or just the area you prefer. Sadly enough you will feel very restricted when playing this mode because for some reason the game does not allow you to build a park worthy of the name ‘epicness’. Why is that you say? The game limits you to about 10-12 normal rides out of the 40ish you are able to choose, 10 shops out of that same amount, only a few scenery items and most important of all only 2 or 3 roller coasters even though the game is called ‘roller coaster tycoon 3d’. Even after reaching all of the limits you were able to reach your park will still feel quite empty and most important of all not even close to being decorated enough to be very attractive or give it that extra personal touch. The game even limits you when hiring your own staff to 4 of each type. When you build a decent amount of paths to create a bigger park you will constantly get complaints that you have too much garbage on the roads that you need a janitor to clean up the mess. A problem easily solved if the game allowed you to hire more janitors or place more garbage cans. Keep in mind if you decide to place a decent amount of garbage cans this will severely limit you in placing other scenery items. Personally I’ve never seen a amusement park with a theme based around garbage cans. Another thing that seems quite limited when you placed all you could place is the amount of ‘peeps’ that enter your park. You will rarely see those monsterqueues you have gotten to know from the PC versions of Roller Coaster Tycoon and if you happen to see one it will mean all your other queues are empty. This started out to be a great mode for those wanting to explore the boundaries of the amusement park kingdom but ends up falling way too short of what it’s supposed to be. 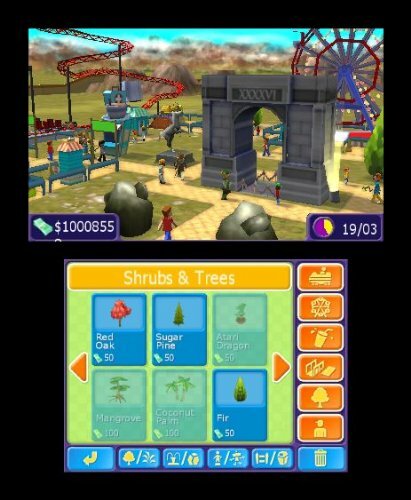 This 3DS title will provide you with several hours of fun when playing the story mode, however the park sandbox mode will be found quite lacking compared to the sim games we have already seen in the past. 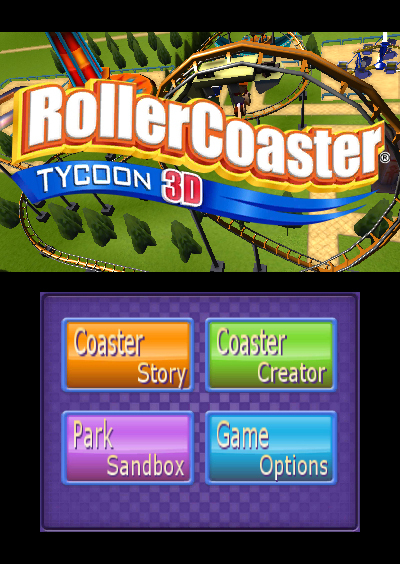 Overall Roller Coaster Tycoon 3D is a decent first step in making this type of game accessible on the handheld consoles.